Totally gratuitous photo (courtesy hannahbabble) of the 3berry pie I baked yesterday for the Australia Day BBQ I attended. 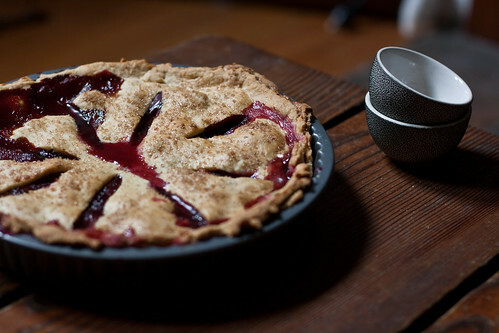 Fabulous pastry recipe courtesy of Chez Pim's The One Pie Dough to Rule Them All. One of the consequences that come with the territory of writing a food blog such as this is frequent emails from readers asking for particular Melbourne restaurant recommendations. Where I can I try to respond to these emails, particularly when the question being asked is asked politely and has a clear scope and realistic expectations. At other times, well... let me show you a sample. 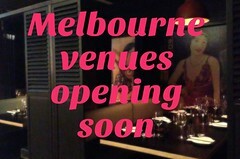 I am coming to Melbourne in January and was hoping you could make my life easier by recomending a great place to eat. I am trying to arrange a ladies night out on the town and want to go some where realy special, not as in a pricey place but something a bit out the orindary were they will go wow. I am thinking a trendy place in a lane were we can have pre drinks and then dinner, bit of good music. We are happy to venture anywhere by tram etc. I have come across your website and found it illuminating. So, I thought, you are the right one to ask me help me solve my problem. It is this. I am looking for a restaurant/pub that has either a separate room or is prepared to hire itself out for birthday bash. The requirements are this: sit down dinner for 50-60 people at tables of 6 or 8, room to bring in a band so it needs dance space. I would prefer eastern, inner suburbs or city locations. I will be away from 14 Dec until mid January so if you respond during that time and don't get an answer from me, it is b/c I will not be near a computer. 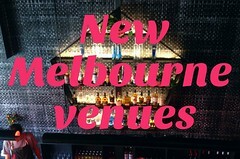 But in light of the increasing number of emails from out-of-towners wanting Melbourne tips, I've put together a Gastronomic Visitor's Guide to Melbourne. If you have strong views about places that should absolutely positively be recommended to visitors to our fair city, please let me know! great idea - I will need to come back and check it out next time I am looking for ideas! One little thing - the pintxos at Naked for Satan are $2 a toothpick. hahaha, yes i think people expect too much of food bloggers. we don't exactly have that much time or "memory-power" to remember every single little detail. I think Proud Mary in Collingwood should be on the brunch/coffee list!! What do you reckon!? All good stuff! I've certainly taken out of town friends to a few of those places on the list. Good places for Beer on Tap - You've already mentioned the Local Taphouse, but also the Royston, Beer Deluxe at Fed Square, Upstairs at Young and Jacksons. I'm sure there are some other good ones about. Breweries in the Burbs - Mountain Goat, True South at Black Rock, Two Brothers at Moorabbin. Aah you've saved us a few clicks!!! Brill! Inspired. Will make all future trips that much easier - and better. Thank you! Superb guide. One of the best going that I have seen. I would include (for solo diners in particular) Cicciolina - they don't take bookings. keep you happy in the bar and get you onto a table really fast. The food is comforting, reliably good and sometimes great. Second Cumulus Inc. Still searching for another great place for dinner where they don't try and put you in the bar if you are by yourself!